Australian shipbuilder Austal has won a $1.6 billion contract  to build two littoral combat ships for the US Navy and is in talks with Trinidad and Tobago about a potential patrol boat deal. The ships will be designed  in Australia but built in Austal’s shipyard in Alabama. Earlier this year, the Australian government unveiled its strategy  to become one of the world’s top 10 defence exporters. A US congressman has called  for the Five Eyes nations to work together on an ‘international joint-build, cost-sharing program’ to build the next generation of nuclear-powered fast attack submarines. The Australian government’s $50 billion deal  with French shipbuilder Naval Group to build 12 conventionally powered Shortfin Barracuda submarines has been criticised over cost and the potential for a ‘capability gap’, though Defence Minister Christopher Pyne has dismissed  calls for a Plan B. The debate  over the need for Australia to acquire  nuclear submarines has gained prominence in Australian strategic discourse in the past few months. Recently declassified documents reveal  that the scientific mission that discovered the Titanic in 1985 was primarily tasked with examining two sunken US nuclear submarines, USS Thresher and USS Scorpion. US Navy commander and scientist Robert Ballard said that he was offered funding to search for the Titanic only if he undertook an expedition to study the impact of the lost nuclear submarines on the marine environment. The 67th Operation Christmas Drop ended on Monday. The joint operation  between the air forces of Australia, the US and Japan is the world’s longest running airdrop training exercise. Food, clothing and toys were dropped  to 57 remote islands in Micronesia between 10 and 17 December. The tradition began in 1952 when US Air Force officers saw islanders waving to them and dropped a bundle of supplies as a present. 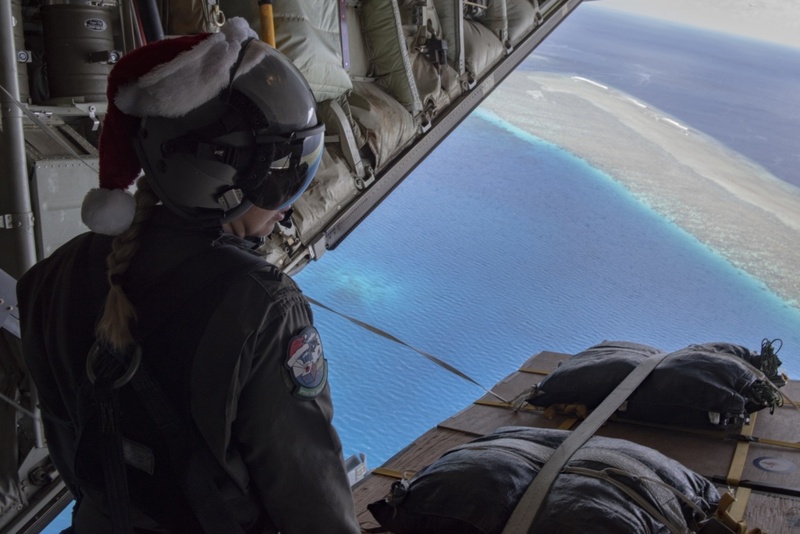 The RAAF used C-130J Hercules aircraft fitted with external tanks for the first time  in this year’s Christmas Drop. Watch a video of the operation here . The US Government Accountability Office has told Congress that it will be difficult to meet  Defense Secretary Jim Mattis’s goal of ensuring 80% of military aircraft are mission-capable by the end of 2019. Defence capability boss John Pendleton highlighted the 15% mission capability rate of the F-35 last year as an example of how far the military had to go. The US Navy said its Super Hornets have an availability rate of 49% and that it would be a ‘stretch’ to reach the Mattis target. The Royal Air Force has commissioned its first  Sikh and Muslim chaplains, Reverend (Flight Lieutenant) Mandeep Kaur and Chaplain (Flight Lieutenant) Ali Omar. Christianity is the dominant religion  in UK forces and other religions are underrepresented when compared to the overall population. It’s anticipated that the recent lifting  of the five-year UK residency requirement for Commonwealth citizens will help address the capacity and diversity gap. Kosovo has passed controversial laws  to create a national army from its security force. The move has been labelled as ‘historic’ by the US, but NATO chief Jens Stoltenberg expressed regret that the plan ignored his organisation’s concerns. Before the legislation was passed, Serbian prime minister Ana Brnabic threatened that her country could respond with a military intervention . Under the current plan, Kosovo’s army will comprise 5,000 active soldiers and 3,000 reservists. Kosovo gained independence from Serbia in 2008. France has delivered 1,400 AK-47 assault rifles  and three amphibious vehicles to the Central African Republic army. The Central African Republic has struggled to recover from its 2013 civil war and the military assistance (along with €24 million in civilian aid) is meant to help the country fight back against Seleka rebels that have been a source of instability for CAR and a threat to its UN-backed government. Some 4,000 French troops are deployed in several African countries as part of the counterterrorism effort known as Operation Barkhane . China will send 225 troops  to the Darfur region in Sudan to serve in the UN peacekeeping mission there. A contingent of 100 soldiers has already departed Beijing, and the remainder will leave on 18 December. The troops will work on engineering projects, constructing and repairing roads and airfields. China has troops serving in various UN peacekeeping missions in Africa, and two of its troops were killed  in 2016 in South Sudan. Virgin Galactic has become the first company to reach space with a spaceship intended for private travel —at least by the company’s definition. While undoubtedly a major milestone, the VSS Unity only reached an altitude of 82 kilometres, well below the generally accepted 100-kilometre-high boundary of space. However, as space law professor Chris Newman told CBC, there’s no legal definition  of where space begins—highlighting some of the critical foundations missing from the rapidly developing industry. The new home of the Australian Space Agency  at the ‘Lot Fourteen’ innovation precinct in Adelaide will help cement Australia’s position in the industry, which is worth $460 billion globally. Prime Minister Scott Morrison said  South Australia is the ideal location for the agency as it’s already a hub for the space industry, which is expected to create up to 20,000 jobs by 2030. In this podcast , Jason Held from Sydney-based Saber Astronautics says limiting space hubs to a single state could limit the sector’s growth. A NASA-funded Rocket Lab mission successfully launched 13 cubesats into orbit from New Zealand on Sunday. The ELaNa-19 mission  is part of NASA’s Educational Launch of Nanosatellites and CubeSat Launch Initiative programs, intended to encourage young people’s interest in science and support research by academic institutions and NASA centres. The launch follows Rocket Lab’s declaration that it will provide regular and reliable  space launches. Amid China’s crackdown on social media ‘dissidents’, it has come to light that the government is taking a particularly strong stance against Twitter users . On 5 December, human rights organisation China Change  released testimony from hundreds of Twitter users who had been detained or interrogated on the mainland. Despite Twitter being banned in 2009, circumvention tools have enabled an estimated 10 million Chinese users  (as of 2016) to access the platform. The testimony suggests that police have forced those questioned to remove posts and close their accounts. Businesses in the US, New Zealand and Australia, as well as several schools in Canberra , have been evacuated after receiving emails containing demands for US$20,000 worth of bitcoin to stop the detonation of a bomb. It’s believed to be a new scam from a group previously linked to sextortion emails , but experts doubt its effectiveness . Last month an Israeli-American man  was sentenced to 10 years’ jail in Israel for making thousands of bomb threats in 2016 and 2017 and offering to call in fake bomb threats in exchange for bitcoin.